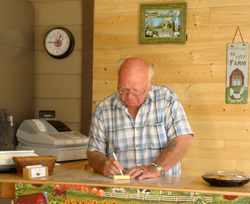 The Farm Stand was constructed in 2010 to provide a nice place for customers to be able to come and select desired products. Today the Sandoz family offers a wide selection of USDA beef and pork, vegetables from early spring to late fall, sweet cherries, pears, apples and a selection of other fruits. Also, a wide variety of jams/jellies, canned fruits, pickled veggies and canned tomato products are available. Wed. – Sat. 11 a.m. – 6 p.m.
Fri. and Sat. 11 a.m. - 4 p.m. Directions: In The Dalles, from West 10th Street go south on Mt. Hood St.
Mt. Hood St. becomes Mill Creek Rd; proceed about five miles.